Pentax Ricoh has rolled out its follow up to the GR Digital IV, the GR, featuring the same stripped back looks and high end specs with a new APS-C-size 16.2MP CMOS image sensor with no anti-aliasing filter. The design follows the same clean, no-nonsense line of its predecessors, with two control dials allowing SLR-like operation. Nice. As ever, there’s no zoom on board, with the GR coming with a fixed, newly designed 18.3mm (28mm eq.) f/2.8 lens, while other upgrades see the camera sport a new high-performance GR ENGINE V imaging engine, an AF button and an aperture preview button. We’ve always loved these little fellas – we’re still using the original Ricoh GR – although some may find the RRP of £599.99 (plus £222.99 for the add on viewfinder) a little high. 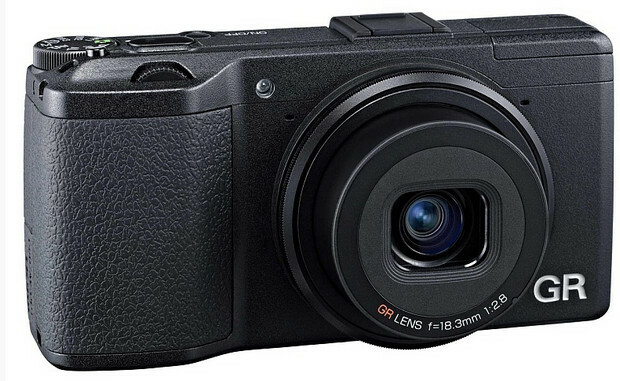 It may be pricey but with its bijou 17 x 61 x 34.7mm dimensions and 245g weight, it is the cheapest, lightest and smallest APS-C digital compact camera you can buy. The camera will be out in May. We’ll see if we can get a review model because we’d love to go street shooting with this one. PENTAX RICOH IMAGING COMPANY, LTD. is pleased to announce the launch of the GR. This new RICOH-branded expert digital compact camera not only offers the top image quality available in the renowned RICOH GR series, but features a pocket-sized body that enhances the camera’s operability and portability in everyday snapshot use. Developed as a successor to the GR DIGITAL IV (released in October 2011), the new GR inherits the product concept of the GR DIGITAL series while upgrading the basic specifications and functions of its predecessor. It features a newly designed lens to assure sharp, clear image resolution, even at image edges. Thanks to the combination of a newly developed APS-C-size CMOS image sensor (with approximately 16.2 effective megapixels), the high-performance GR ENGINE V imaging engine and an Anti-aliasing filter-less design, the camera assures high image resolution, gradation-rich colour reproduction and improved image quality, especially at high-sensitivity shooting. In addition to improvements in quick shooting capability, an AF button and an aperture preview button — both easily accessible with the thumb — have been newly added to upgrade the camera’s operability during everyday shooting. It also offers a range of user-assisting features, including in-body RAW-data development and focus assist to facilitate manual focusing. The new GR is a pure joy to own and use, as it offers a wider selection of functions and much-improved performance, while retaining a pocket-size body and the refined design shared by all GR-series models. The GR will be available from May 2013 at an RRP of £599.99 (body only). Viewfinder RRP £222.99. • The GR comes equipped with a newly designed GR Lens with the angle of view equivalent to 28mm in the 35mm format. Designed to be compact while providing high performance, this lens delivers high-resolution images with edge-to-edge sharpness and rich contrast, while minimizing distortion and chromatic aberration by incorporating two high-precision aspherical lens elements and a highly refractive low-dispersion glass element in its optics. It also offers a few extra benefits unique to a unifocal lens, such as sharp, crisp image resolution even at the open aperture of F2.8, and superb image definition with backlit subjects. • Thanks to its nine-blade diaphragm, the GR produces a natural Bokeh effect at larger apertures, while creating beautiful light beams at smaller apertures. • Thanks to its manually adjustable ND (neutral density) filter, the GR lets the user open the aperture up even in bright sunshine for a wider range of creative expression. • The GR comes equipped with a new APS-C-size CMOS image sensor, providing an image-sensitive area as wide as that of a PENTAX DSLR image sensor. Thanks to this large image sensor, the GR offers approximately 16.2 effective megapixels to produce beautiful, high-resolution images. • By coupling the large image sensor with the newly developed GR ENGINE V imaging engine, the GR offers high-sensitivity shooting at ISO 25600 with minimal high-sensitivity noise to produce high-resolution, rich-gradation images with a natural sense of depth and a beautiful Bokeh effect. • The image sensor is optimized for the GR 18.3mm F2.8 Lens. To give top priority to image resolution, an Anti-aliasing filter-less design has been adopted to bring out optimum lens performance and assure exceptional image quality over the entire image field. • The GR provides a high-speed autofocus system that can focus on the subject in a mere 0.2 seconds,* thanks to the newly developed lens driving mechanism and optimized AF algorithm, as well as the ever-faster data readout speed from the image sensor. With its start-up time of approximately one second, the GR responds quickly and flawlessly even to fleeting shutter opportunities. • The GR’s AF Continuous Shooting function captures a series of photos at a maximum speed of approximately four images per second, allowing the photographer to capture a fast-moving subjects, such as athletes and wildlife, in sharp focus. * Measured against CIPA standards. 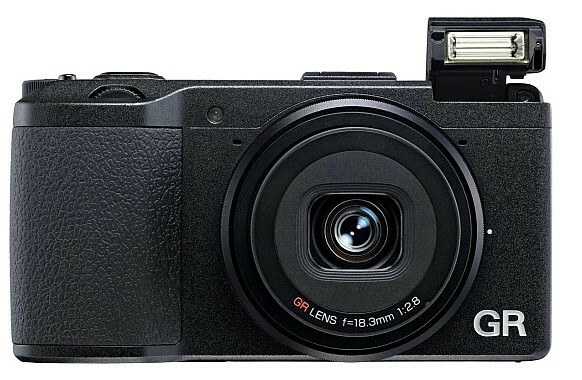 • Despite the incorporation of the large image sensor, the GR has a compact and portable design. Its casing is made of a magnesium alloy that is both light and highly rigid, while its exterior design retains the flair and style typical of the GR series. • The body is designed for maximum holding comfort and operational ease. All control buttons are laid out for easy access with the right hand. A preview button has been added to the camera’s side panel for quick confirmation of the depth of field before shooting, making it easier for the photographer to visualize the level of the Bokeh effect in the resulting image. • The focus-assist function comes in handy during manual-focus operation. This, coupled with the image magnification and target shift functions, simplifies manual-focus shooting. 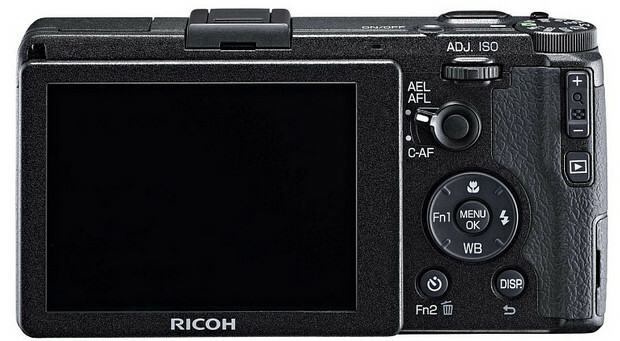 • An AF function button/lever has been newly added to the camera’s back panel. When the lever is set to the Continuous AF (C-AF) mode, the user can capture a series of images of a moving subject — all in sharp focus — by pushing the shutter release button while depressing the AF button. The user can also choose an optional setting, in which the continuous shooting mode is automatically activated while the C-AF button is pressed. • The GR features the PENTAX-original Shutter-speed/Aperture-Priority (TAv) exposure mode, featured only in PENTAX-branded digital SLR cameras. This innovative mode automatically sets the optimum ISO sensitivity based on the shutter speed and aperture selected by the photographer. • Aperture and shutter speed indicators have been added to the monitor screen. The layout of on-screen indicators has also been optimized to the 3:2 aspect ratio, with redesigned grid guide and electronic level. All these combine in the GR’s greatly upgraded usability. • Although it incorporates a large-aperture lens, the GR features a built-in lens barrier mechanism that automatically opens and closes the barrier as the power is switched on and off. This allows the user to react swiftly to all photographic opportunities. • The Image Effect modes allow the user to add a variety of visual effects to create distinctive expressions without the need for a PC. For greater creativity, three new modes have been added for the GR: Retro for a nostalgic ambience with subdued saturation; High Key for a bright, lively result while retaining subtle gradation in highlights; and Miniaturize for a diorama-like appearance, popular in the CX-series models. Selection of the nine Image Effect modes is pushbutton-easy, with the direct-access Effect button positioned on the camera’s side panel. • The precision of the Multi-pattern AWB (auto white balance) function has been upgraded to automatically achieve more faithful colour reproduction by more clearly defining white balance to fit the light source of each segregated area of the image when there are mixed light sources. • The Dynamic Range Compensation function, which minimizes completely washed-out highlights and pitch-black shadows, now offers pixel-level compensation to almost eliminate borders along the luminance threshold areas and achieve the smoother transition of gradation. • The Interval Composite mode captures a series of images of the night sky at a fixed interval, then selects and combines only the high-luminance pixel data from each of those images to produce a single composite image. This mode comes in handy when the user wishes to combine the trails of the moon and the stars with a landscape. • GR offers a variety of PC-free image processing functions, including in-body RAW-data development to output JPEG-format files. Taking advantage of the H.264 video format, the GR’s Full HD movie recording function captures high-quality, extended movie clips (1920 x 1080 pixels, 16:9 aspect ratio) at a frame rate of 30 frames per second. Image Effects such as Retro and Bleach Bypass are available during movie recording. During recording, its AF system remains active and the camera continuously focuses subjects in the centre of its angle of view. With this AF mechanism, the user is always assured of sharp focus, along with the high image quality delivered by the combination of the GR Lens and the large image sensor. With Eye-Fi wireless LAN SD memory cards, the user can automatically transmit recorded images to a smartphone,** and even select favorite images and resize them before transmission. In the playback mode, the user can also recall the transmitted images on the monitor using the Effect button on the side panel. ** The automatic transmission mode must be selected in advance on the settings menu. Function-enhancing firmware upgrades, which have been popular with all GR-series models — from the GR DIGITAL to the GR DIGITAL IV — are scheduled to become available along the way for the new GR as well. By upgrading the camera’s firmware, the user can always take advantage of the latest, most advanced functions to optimize the camera’s performance. *** When this mode is selected, the largest recorded size is M.